All mail-in ticket order forms are data entered by an independent professional accounting service. 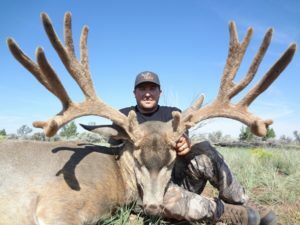 This data, along with online ticket order data for the 10 AZ Big Game Species, the Swarovski Optics Package and the New Mexico Elk Hunt are then used to produce computer generated tickets with your name, address, city, state, zip, and phone number and the species/item that you have purchased a ticket(s) for. If you purchase more than one ticket they are all computer generated prior to the drawing. These tickets are then placed into separate raffle barrels and the winning tickets are pulled during a public drawing . One winner per species, one optics winner, and one incentive hunt winner will be drawn, for a total of twelve (12) winners . After each winning ticket is drawn, the remaining tickets are placed in containers and made available for inspection for one year. Winners are contacted by phone and mail. Drawings for the Buy Early, Buy Often, Win Big online purchase bonus prizes will be conducted electronically on or before the 5th of the month and announced on this website.